Many of us are familiar with the Bezazian Branch Library at Magnolia and Ainslie, and its wonderful free programs. How many of us realize that this busy library exists as a lasting reminder of a father's love for his son? 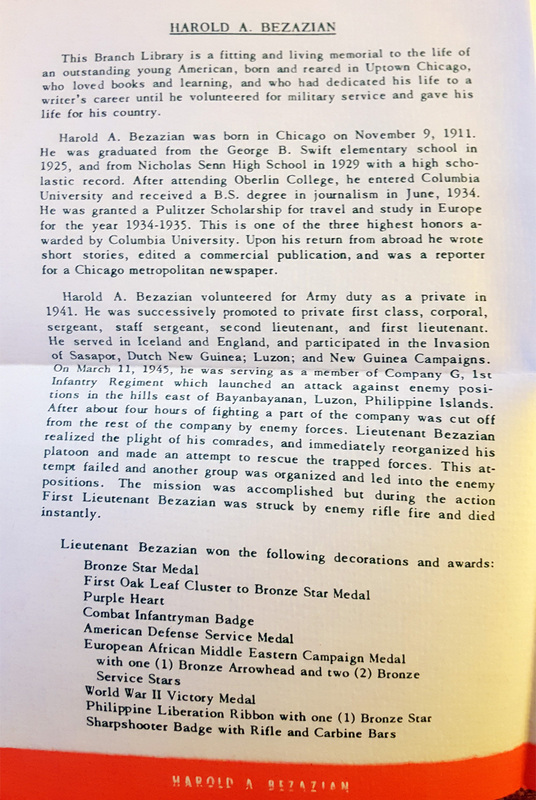 John B. Bezazian was an Armenian immigrant who came to the U.S. in 1895, first settling in Rhode Island, and then making his way to Chicago in 1906. He and his wife Daisy had three children: Paul, Roselle, and Harold. Despite experiencing prejudice in his adopted country (he spoke no English, had little money, and was dark-complected), John acclimated and eventually made a fortune for himself. His money came from canny real estate holdings, a large tung tree farm in Mississippi, and a company that sold fine imported rugs. He was a kind, philanthropic man who on several occasions brought children to the U.S. from Armenia so that they could have surgeries that were not available to them at home. His youngest son, Harold Arsene Bezazian, was born in 1911 and grew up in Uptown. He attended Swift Elementary School and Senn High School. After attending Oberlin College and graduating from Columbia University with a degree in journalism, he became a reporter for the Chicago Times, then managed his father's 520-acre Mississippi farm. He spent a year in Europe after winning a Pulitzer Traveling Scholarship. He joined the Army in March 1941, and aged out in November 1941. After Pearl Harbor was attacked in December of that year, he knew that the military would need reinforcements. According to family members, Harold re-enlisted, saying that it was better for him to go than another man who would leave behind a wife and children. 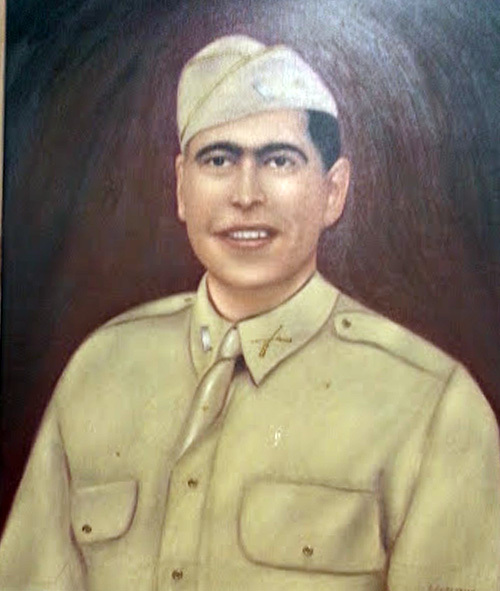 He was awarded a Purple Heart and Bronze Star during his service, and saw action in Europe and New Guinea. 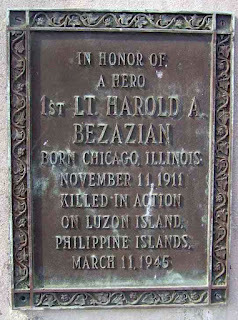 Then in March 1945, in a battle on Luzon Island in the Philippines, Lt. Bezazian was killed by enemy fire while leading a rescue operation for soldiers under his command who had become separated from the rest of the unit. He was 33 years old. His commanding officer wrote to his father that "Your son's constant and untiring display of personal bravery undoubtedly saved the lives of a great number of his friends and he died while rescuing them from almost certain death." 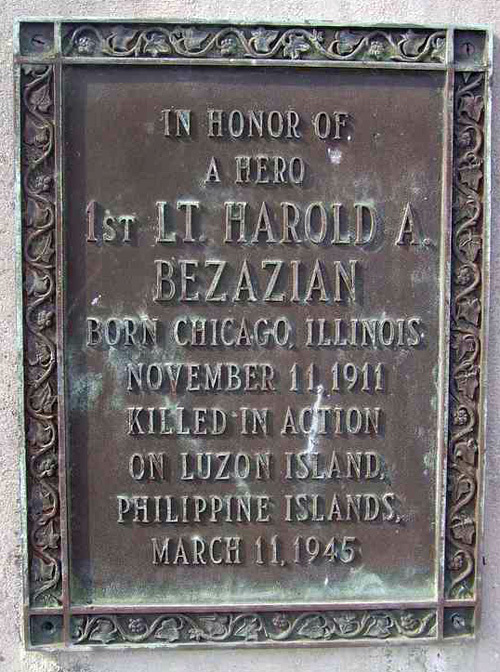 He is buried in the Philippines, at the Manila American Cemetery. But his story didn't end with his passing. At the time of Harold's death, John Bezazian was a wealthy man in his 70s. He wanted to ensure that his son's heroism and memory lived on. And that's when the legacy of generosity surrounding Harold Bezazian began. John used Harold's Army death benefits to create scholarships so that rural Mississippi teenagers could attend Mississippi State University. Some of the teenagers who had done manual labor at the tung tree farm were recipients of those scholarships, and several of them paid it forward, creating scholarship funds of their own for the next generation. One told a reporter in 2008, "I remember my daddy taking me to the Trailways bus station in 1955. He bought me a one-way ticket to Mississippi State, then reached in his pocket and gave me the best he could, $20. Because of Bezazian, that's all it cost my parents for me to get a college education." John created three parks in impoverished and underserved parts of Gulfport, Mississippi, naming them after Harold. He said he did so because he remembered what it was like to be poor and discriminated against, and he wanted to make life a little better for children living in those areas. Pillars with plaques honoring Harold are at the entrances of each of the three parks. 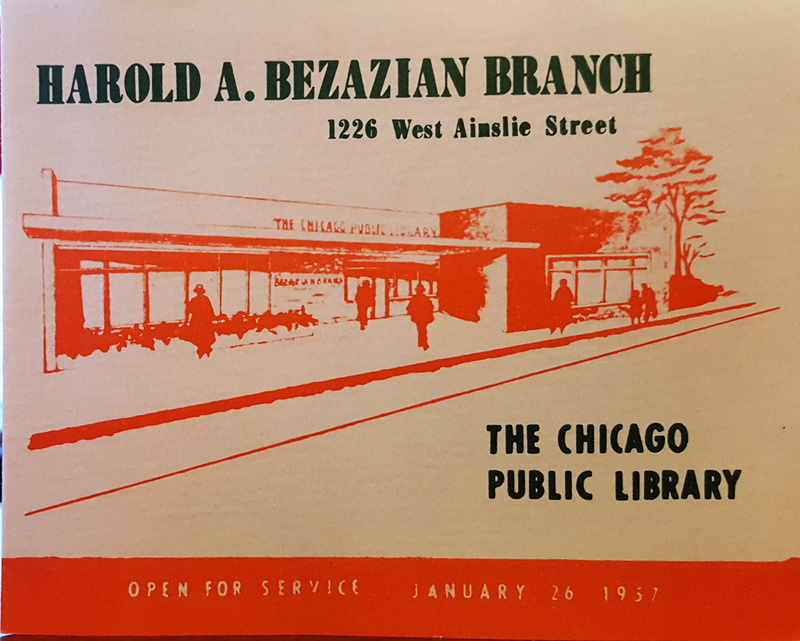 In December 1951, John — at the urging of his daughter-in-law, Uptown activist Florence Bezazian — donated $50,000 ($475,000 in today's money) to the City of Chicago to kickstart fundraising for a library in his son's memory. It was an appropriate memorial for a young man who had devoted himself to the written word. 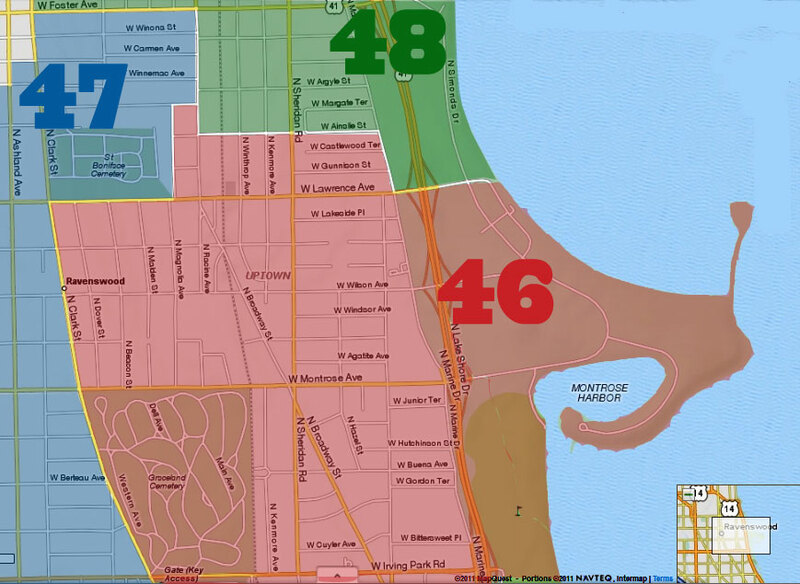 The terms of the gift specified that the new library had to be located on or near Broadway, and north of Lawrence, in the neighborhood where Harold grew up. John also requested that a bronze plaque honoring Harold be placed in the lobby. 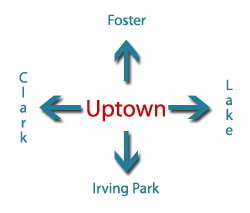 At the time, Uptown was served by the Sheridan branch library. It was located in a rented storefront at 4422 North Broadway, in the old terra cotta Azusa Building. 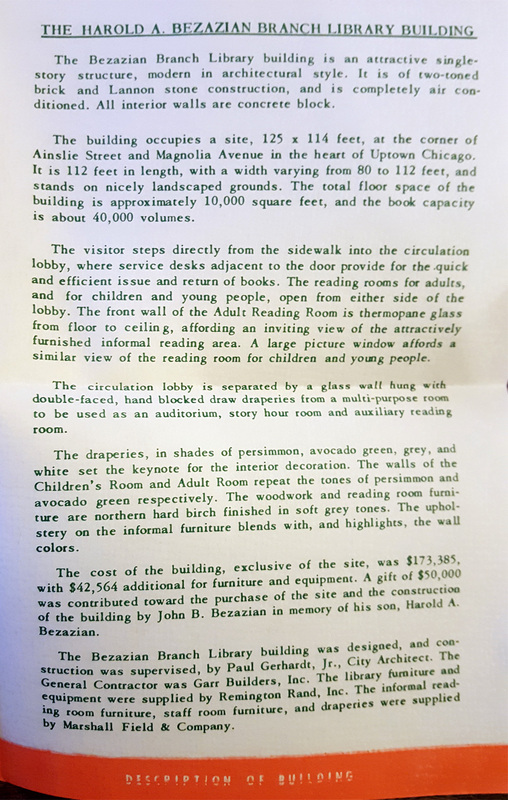 Upon receiving John's monetary gift, the Chicago Public Library began looking for a property that would meet the requirements of the bequest. Eventually a suitable site was found at 1226 West Ainslie. In February 1956, construction of the large modern library began, with the Bezazian family in attendance at the ground-breaking. The Tribune described the future library as "an 112x113 foot building in Lannon stone and face brick. It will contain a reading and story room, childrens' and adults' reading rooms, a workroom, librarian's office, stacking and utility rooms, and will be air conditioned." The library was dedicated on January 26, 1957, with 175 civic leaders in attendance. Of course John and other family members were there. Commemorative pamphlets were given to attendees, a few pages of which are shown in the thumbnail photos to the right (click to enlarge). The pamphlet notes that the library's furniture was provided by Remington Rand and Marshall Field & Co. The draperies were "persimmon, avocado green, grey and white" (well, it was the 1950s). The branch’s opening manager was Gertrude Gscheidle, who later became the long-serving Library Commissioner. 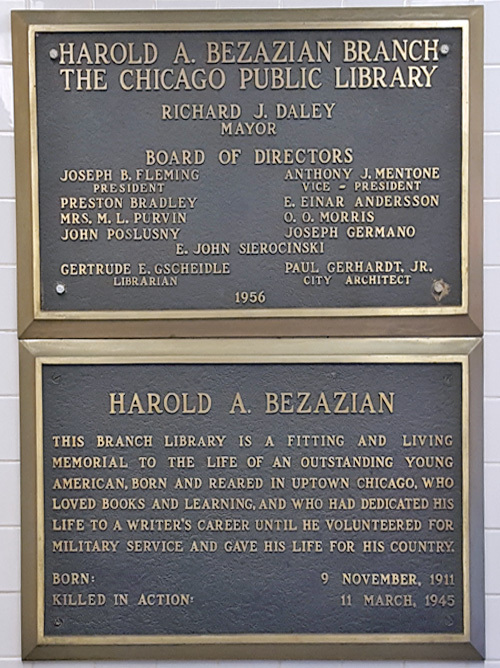 This branch library is a fitting and living memorial to the life of an outstanding young American, born and reared in Uptown Chicago, who loved books and learning, and who had dedicated his life to a writer's career until he volunteered for military service and gave his life for his country. His father's love and pride come through loud and clear in those words. John Bezazian died in Chicago two years later, in June 1959, at age 84. The gifts he gave in the memory of his son still are felt today, by college students in Mississippi, by children playing in Southern parks, and by those who seek knowledge in Uptown. 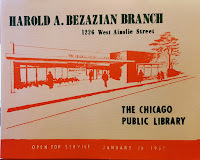 The Bezazian branch is one of the busiest in the CPL system, serving the community through programs, films, and classes. 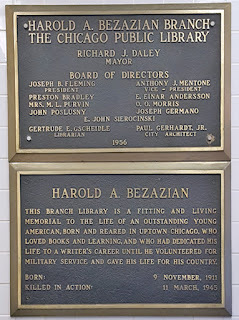 Touchingly, some Bezazian descendants still live in the neighborhood and are loyal patrons of the library that bears the name of their ancestor. They, like us, are the beneficiaries of this "fitting and living memorial." Here's to you, Lt. Bezazian, and to the father who made sure you weren't forgotten. If you are interested in being an advocate for the Bezazian Branch Library, the Friends of Bezazian meets bimonthly. The schedule is here. Thank you to Mark Kaplan, manager of the Bezazian branch, and Laura Adler of CPL for their assistance in researching this post. Wonderful story. Thank you for preparing it. That's where I really cultivated a love for books in my youth.